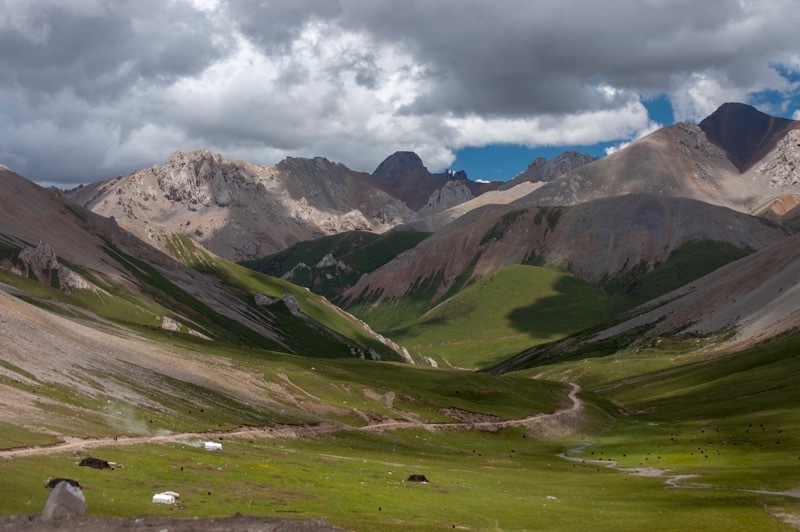 During our travels across the Tibetan Plateau, we were struck by the region's remote, rugged, and wild beauty. Bitterly cold winters and multicolored hillsides of summer wildflowers - bursting from seas of green that roll onandonandon - both possess their own beauty. It's a place we love and have been shaped by. We've also been shaped by the Tibetan nomads who roam these seas of green with their yak. They welcomed us into their homes, sharing their hospitality and lives with us, becoming friends. They taught us about the yak and their intricate relationship with the animal. Without the yak, Tibetan nomads wouldn't be able to survive in such a desolate environment. Tibetan nomads depend on the yak for survival. The daily supply of yak milk is used to make yoghurt, cheese, and butter for making butter tea or mixing with barley flour for breakfast each morning. Along with yak meat, these staples provide most of the calories necessary for keeping warm and for clmbing the steep mountain slopes as they herd their yak. As the Tibetan Plateau is above tree line, nomads depend on dried yak dung to fuel the stoves they use for cooking and for heating their homes and tents. The coarse shaggy outer coat of the yak is woven into nomad tents, or made into rope. In a rapidly changing and modernizing environment, it is difficult for many nomads to make ends meet. Many families struggle to come up with the finances needed for living expenses, sending their children to school, and paying medical bills. Apart from the yak, Tibetan nomads have very little with which to provide for their families. Having become aware of the challenges many nomad families face, we were compelled to find a way to help them thrive. One day, I was visiting some nomad friends. We were sitting in their stone house, and though it was summer, I was cold because of the elevation. I was drinking butter tea to try to warm up. One of the nomad women was weaving together a length of black and white rope out of some guard hair from their yak. Through the windows I was watching the yak come down the hillside and remembered my friend who told me about how warm and soft the downy undercoat of the yak is. I had a revelation, and had to see if we could spin yarn from this amazing fiber! As we learned more and more about the wonders of yak down (how it is soft as cashmere, warmer than merino, warm - even when wet, temperature regulating, naturally hypo-allergenic, and doesn’t pill) we grew more and more excited about the opportunities the sale of yak down could afford in helping Tibetan nomads better provide for their families, and preserve their way of life as they enter a modernizing world. Around this time we were connected with Poul and Rebecca who started Reywa Fibers. They had traveled through Tibetan communities for years, doing development projects focused on education and environmental preservation through a small NGO they helped establish. They started Reywa Fibers as a way to help nomads benefit from the sale and trade of the fiber their animals produce. They invested the profits from the sale of Reywa's yarns back into nomad communities to help families send their children to school, and to help with grasslands preservation. The NGO ethos carried over in the founding of Reywa Fibers, and a social enterprise was born. When we first learned about Reywa Fibers, we fell in love with the Reywa Story and it's social vision. When we were presented with the opportunity to purchase Reywa Fibers and to become part of its story, we jumped at the opportunity. We are excited to take Reywa Fibers into its next chapters! Reywa means hope in Tibetan. Reywa means “hope” in the Tibetan language, and the desire to be a catalyst for hope is what drives our company vision. Our passion is to see Tibetan people benefit directly from the development and sale of the fiber their animals produce, enabling families to live healthy lives, full of hope for the future. With an emphasis on Education, Reywa profits have sponsored several children of Tibetan families. As Reywa grows, our ability to impact Tibetan communities will grow as well. At Reywa Fibers, we take this amazing fiber and have it gently spun into luxuriously soft and warm yarns with a buttery handle for knitters and fiber artists, like you. We find our color inspiration in the beauty of the ever changing colors of the Tibetan Plateau and lovingly small batch hand dye each skein in Minnesota. When knitting with Reywa Fibers yarn, you add to a fantastic story. Each purchase of Reywa’s yarn enables us to put money back into Tibetan communities. With each piece you knit using Reywa’s yarns, our story gets knit into yours, and yours gets knit into ours. A grandma knits Harmony baby hats for a crisis pregnancy center. A Tibetan girl goes to school. A TBI survivor knits her first sweater. A nomad mother receives funds to live in the city during her high risk pregnancy. An ER nurse knits the Colors of Reywa Cowl to relieve stress. A Tibetan family sells the down they’ve collected and can afford to buy fruit and vegetables. Thank you for joining our story, and for allowing us to be a part of yours. Thank you for joining our story, and for allowing us to be a part of yours.